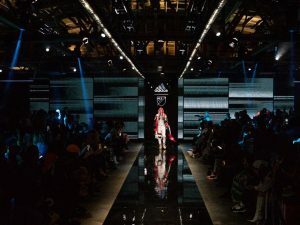 Home / International Football / Americas / adidas & MLS host Seams Fashion Show to celebrate 2019 Season! To celebrate the start of the 2019 season, long-standing partners adidas and Major League Soccer presented their 2019 team jerseys out of the field and on to the runway. The two houses came together to show that uniforms are not only meant for players and sports fans but can be worn from the stadium to the street and accessed by a wider style community to symbolize city identity and pride. Breaking the traditional mold in which sports uniforms reside, the showcase reinterpreted the jerseys as pieces of fashion through the vision of four emerging fashion figures. In the heart of Los Angeles’ Fashion District, City Market was transformed into the adidas & MLS hub where sport, fashion and culture intersected. Through a curated, 48-look fashion show, the 2019 collection was transformed by Sara Gourlay , Andrew Andrade , Pierre Davis of No Sesso and Corey T. Stokes . The four notable stylists presented their creative take on the 2019 MLS & adidas kits, revealing diverse style directions meant to inspire fans of soccer and fashion alike. The looks were presented by high profile athletes and models such as volleyball star Alix Klineman , LAFC star Lee Nguyen and Deng. Previous XtraTime VIDEO: Mohun Bagan’s Debasish Dutta speaks Super Cup boycott! Next Minerva Punjab FC win the Amarjit Singh Memorial Cup Tournament!